Barack Obama won the Iowa Caucuses last night with 37.57 percent, with John Edwards coming in second at 29.75 percent. Clinton followed with a very close third at 29.47 percent. This poses a big problem for Hillary as the anti-Hillary vote coalesces behind Obama. Hillary has benefited from the anti-Hillary vote being divided between Obama and Edwards, but soon she will no longer have that luxury. Further, the supporters of the other candidates who will all certainly drop out tonight will also likely go to Obama. Clinton’s high negatives will soon be apparent, showing up in support for Obama. Not to mention the fact that many black Americans who previously aligned themselves with Clinton may shift to Obama believing he could make history and actually win the nomination after his strong win in Iowa. He also “predicts” that Edwards will drop out after New Hampshire. Although it is likely that Clinton could go on to win in other states, particularly on Super Tuesday — and win the nomination in that way — it is also likely that Obama could now win, as well. 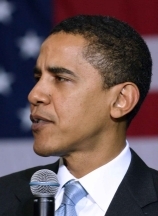 President Barack Obama? Could it really happen? If so, the LGBT community should be worried. While many may applaud the junior senator from Illinois’ “big tent” approach to his campaign, it is also a strategy that has left the LGBT community standing at odds with forces from the religious right and rabidly anti-gay “ex-gay” movement. In South Carolina, Obama’s “big tent” campaign strategy coalesced in the form of gospel concerts attracting huge numbers of African-American voters and featuring a “respected leader” in the “ex-gay” movement. 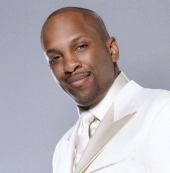 Obama lost the support of many in the LGBT community when he featured [anti-gay entertainer Donnie McClurking (pictured right)] at campaign events in South Carolina and then went ahead with the events even after being personally informed of the entertainers’ very public and virulently anti-gay remarks – making him the only Democratic candidate to be protested by members of our community. While Obama certainly has a pro-LGBT platform, in this circumstance, his actions speak louder than his well-intentioned words and we can not support a candidate that harmed the LGBT community in South Carolina in his quest to become president. Baxley, who is chair of the New Hampshire Freedom to Marry Coalition (which endorsed Edwards), couldn’t be more right. While Obama sought votes, he quickly pushed away the concerns of the LGBT community and caved into his “big tent” mentality, allowing him to give “ex-gay” singer and evangelical minister Donnie McClurkin a platform for his hate (while audience members lapped it up). The LGBT community doesn’t need a president who would place their very real needs for social and civil equality at the same level as those who seek to do nothing but strip them of every civil and social right. LGBT community members, under “President Obama,” would be subjected to daily reminders of their second-class citizenship, officially endorsed by the White House. We had enough of that with George W. Bush. We need a leader who will stand up to the bullies. That is why I rooted for John Edwards last night. As a Southerner, Edwards knows the dangers of oppressor vs. oppressed. He saw it growing up as a child. Could you imagine Edwards ever telling black activists that they should sit down and listen to the concerns of the League of the South? I, for one, have hard time believing Edwards would ever subject the LGBT community to the vitriolic, dangerously anti-gay bigotry and rhetoric of its religious right and “ex-gay” oppressors. All people deserve a place at the table, but when they come to dinner with a plate of hate and exclusion, somebody needs to stand up and issue a correction and rebuke their mis-guided “In the name of God” rhetoric. Obama won’t and can’t do it. Going into New Hampshire, polls show us that Clinton is on the decline, with number two Obama catching up to his rival senator from New York. While Edwards remains in third, his poll numbers have been going up, as well. At this point, the LGBT community has two options: Hope that Edwards pulls off a New Hampshire win and goes on to win the nomination, or start figuring out whether we should support Obama (“big tent” ex-gay support strategy guy) or Clinton (Washington stays the same and the country continues its decline gal). Either option isn’t very appealing. I 100% agree. I just don’t think in generally the community which follows Obama is all that gay Friendly. I’m not sure if Edward’s camp is either, but based on his commitment to National Health Care, I’ve firmly aligned myself with the John Edwards as my candidate. I am gay and I am not only not worried about the possibility of a President Obama I’m avidly supporting him and providing plenty of financial assistance for his run. I believe he is the best chance for a progressive agenda to prevail in November. I was born in 1955 and I am old enough to remember JFK, MLK and RFK and Obama reminds me of those people. He gets the bigger picture. Matt I know how you feel about Obama but if Huckabee the christian reconstructionist wins the nomination things will get a lot worse. The problem with Obama is that he is ignorant when it comes to exgays, the truth is that we need ex-gay survivors to sit down and talk to him and make him understand why supporting ex-gay clergy is demeaning to our community. And as it goes with the Uniting American Families Act ignorance comes into play too, he needs to hear the stories of the struggles of binational gay couples. There is a big difference between being homophobic and being ignorant. One has the facts about us and doesn’t care, and the other doesn’t know enough to make the right decision. Adam… you are right. Obama might be ignorant about issues of “ex-gays” and supporting them really is a demaning stances, however, Obama has also indicated that he doesn’t care. When the McClurkin flap went down, he just thought he could gracefully walk through it and talk it away with a simple op-ed piece. He never sat down with anybody and he never apologized, thinking he could mend the situation by having an openly gay, self-affirming pastor open up the event with a prayer before hand. He doesn’t care… he only wants votes. But Matt at the same we have to have a contingency plan in case Obama does get the nomination. We need to respond to him the way soulforce did on the equality ride. And if that means some of us gays get arrested in order for him to wise up and finally listen to our concerns then that is what we need to do. When I said soulforce I meant the way the responded to anti-gay colleges. I’m kind of well, torn when it comes to the election this year. I was for Dennis Kucinich (always have been) and well, that’s a lost cause. I like things about all of the candidates. I like Edwards for policy, Clinton and Richardson for their experience, and Obama for well, his ‘rock star’ status (being able to rile people up, however, Edwards does a pretty good job of doing that). I honestly don’t think we have to worry if Obama gets in office, yeah, he might not be Edwards, but compared to Huckabee, McCain, Romney, etc…Obama really isn’t going to make gays public enemy number one. None of the top tier candidates were ever for full rights for gays (part of the reason I support Kucinich), but Edwards, Clinton and Obama do come close, and will be better choices for the LGBT community then any of the GOP candidates. You raise some very good points in your comment. Ultimately we are left asking ourselves which of the top-three Democratic candidates could stand up against the top-three Republican candidates. 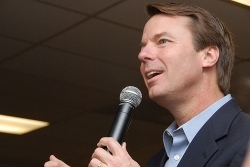 After seeing the results in Iowa (that led me to do some “soul searching”), I was left with only one candidate – John Edwards. I believe John possesses the experience and the leadership to really change America and win against the Republican-machine in November. Ideally, I’d love to see an Edwards/Clinton ticket, but on his own Edwards can win. My vote in May will go to John Edwards. Have we all completely lost it? The MOST important thing is to throw the republicans out..PERIOD. I firstly dont care for Mr Obamas affiliations, however, remember that he is a democrat and ANY democrat would be better then what we currently have in the whitehouse. I would love to see Mrs Clinton in the white house because I do believe had it been she rather then Bill the dont ask dont tell would have never been acceptable. In any case I am seriously concerned that if Obama wins with the abundant religious drivin bigotry in the nation, as well as the “Good old boy” mentality so rampent we could see a repeat of the kennedy tragidy. However if they joined forces, say clinton for prez and obama as vice I suspect the effect would be almost magical. My mother is worried about the election of Barack Obama, she remembers RFK and the disappointment and heartache that it left this nation, she doesn’t want another one. However, she wants a Democrat in office and if Obama is the nominee, she will go with him and vote for him. With that being said, I am pretty much the same, like my mother, for anyone who isn’t a Republican. So RavinRaven, I agree with you there. As for Obama’s inexperience, I have my concerns for sure. I also have concerns about Clinton’s ability to get elected, because unfortunately, she has baggage and people are going to see that (and the fact she is a woman) before her policies, this isn’t true of all voters of course, but it will be on the minds of some voters. As for Edwards, after the NH primary, maybe are counting him out, like Clinton, don’t count him out yet. Still got a ways to go. It’s a shame Richardson dropped out, I understood he had to, money wise and he wasn’t showing up much in Iowa and NH, but he would be a great VP or cabinet member. His work with environmental issues and policies is really something America needs as we need alternative fuel sources, and learn how to converse energy responsibly, effectively and in a way that doesn’t damage the economy drastically. But, Matt, the issue for me is that I don’t /like/ Edwards. He seems like the same Southern Democrat type that gets my heckles up every time (and you know what I mean– we’ve had many a talk about this). He also gives off the white-politic vibe, and reminds me of Dennis Quaid. Don’t get me wrong, I don’t like Hilary for a good number of reasons, and I don’t like Kucinich for several others, but of the candidates I see, Obama has the most to offer in the arenas that I’m most interested in, and he doesn’t give off as much of that weird politic vibe the other candidates do. I cant believe the people in the State of Georiga voted for Obama, and we know it was mostly blacks that voted for him, all because they want a black president. Never mind that the man lacks experience, but what about his muslim ties? I fear for the US if he get to become president. He will try to turn the US into an islamic state. And there is no way in hell I am becoming muslim or converting. I would rather die before that happens. T.J. — A little paranoid there? I think any fear of a Muslim takeover of the U.S. by a “President Barack Obama” is a bit on the crazy side.